Necromunda: I’ve assembled and undercoated all of the gangers now, and I’ve kept some of the bulkier Goliath guns off to help me paint them later. I’ve even pre-shaded some of the gangers to see if that is useful for painting them; I’m working on a sample Goliath and Escher to test. Then I went and screwed up the pre-shading by not thinning the paint enough, and ended up with splatters. Boo. 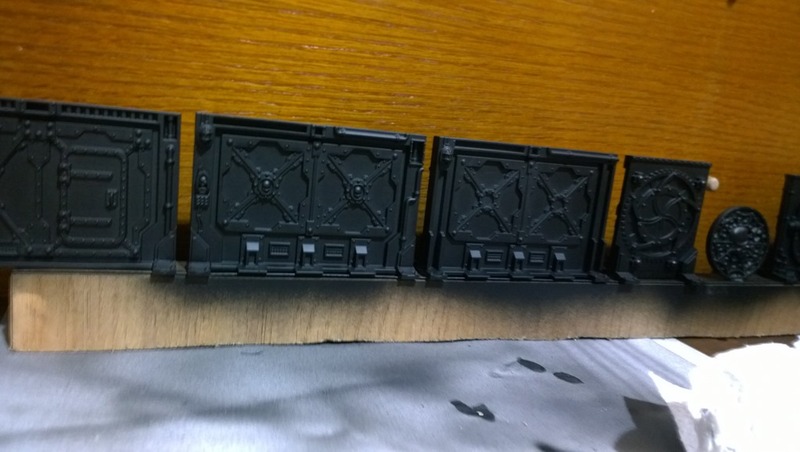 I also basecoated most of the doors with Thunderhawk Blue, ready to have the detail added. Dreadball: I’ve finished cleaning and undercoating all of the new models, and started painting the Yndij and Matsudan. I’ve also jumped back to the Hobgoblins to finish them off, just a few more details to go. I’ve almost finished the Eye in the Sky, adding more little bits to the lenses and working out whether to paint some big screen displays on the outside of the hover-thing, and then finishing off the screens and details on the inside of the console. At the beginning of 2018, I got both Necromunda: Underhive and Dreadball 2.0 – with loads of miniatures each to paint. I also got a fancy airbrush after trying one out at a Siege Studios painting course. I really need to make good progress on some of the piles of unpainted toys I have in the house, and fill up the display cabinets I bought at the end of last year! First off, I have cleaned almost all of the new DB2 models – only a few Yndij to go. 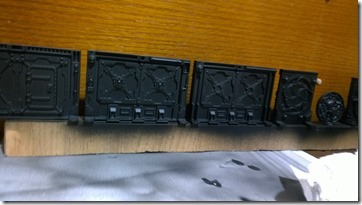 I’ve cleaned and primed all of the Necromunda doors and control boxes, as well as the priority marker. My plan is to pre-shade them (when I get some new white, as I’ve discovered both of my pots have dried up) and use Thunderhawk Blue (and heavy weathering) to make it look a bit like the old-fashioned cardboard terrain. I’ve also primed the DB2 Matsudan and Cyborg teams, the refbot and ‘Eye in the Sky’ – as well as a few Captains for the earlier seasons, and cleaned up a couple more. I want to be able to get all of my painted teams at least updated to include their Captain. Real painting, I finished off Reek Rolat to be a Captain for the Sordus Silage Scroungers and started painting the burly human fan and Xtreme Cheerleaders for DB. I’ve just had one of my regular el-cheapo holidays to visit family. They even bought a new bed for us to sleep on while we were there, since Fred is now in a ‘big boys’ bed. Most of the week was spent relaxing – we drove past a beach, potty trained the little guy (mostly successful, though still in nappies when we go out or for bed) and visited many friends in the pub. I managed to get started on a new book (Pride and Prejudice and Zombies, by Jane Austen and Seth Grahame-Smith) and an old book (Monstrous Regiment, by Terry Pratchett). I barely thought about work at all. We even squeezed in a game of Necromunda against my very first opponent and his Redemptionist gang. I took out my Delaques, and realised that the roster is over ten years old. Impressive. Jen took some Eschers. He set up a three-player scenario, where we had to get to the top of a tower before anyone else to win a prize. He and Jen got into early fighting, shooting each other off of walkways and so on. I snuck in through the other side, managing (somehow) to avoid all attacks, until my leader was caught by an executioner one-shot flamer. He caught fire, and luckily ran straight across the walkway and past two guards (one wielding a rather nasty-looking double-handed chainsaw) towards the Redemptionist base. The following turn, a Redemptionist brother reached the top of the tower, while my Delaque Juve was a level below and held up by an Escher heavy… The Redemptionists only had to wait one turn at the top to be the winners. 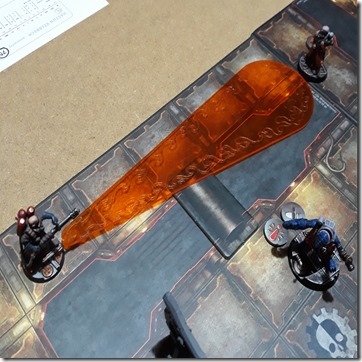 Luckily, my leader doused the flames and ran into the Redemptionist base (undefended, they were all off picking on Eschers) and what had been a forgone conclusion shifted very suddenly – and again, as my Juve finished off the Escher. He was now at least five floors above anyone else, and only one below the top. That’s the first game of Necromunda I’ve won against that opponent – as most of his gangs have an incredibly high rating, I’m always the ‘underdog’. This scenario limited all players to four models at a time, so there was some opportunity to fight fairly there. With the underdog bonus, and hitting the button, plus a few lucky shots on the way, that Juve managed to pick up 37 experience points (from 0!) and got instant promotion. Awesome. Unusually for such a long stay away, I didn’t get any painting done. I almost packed some models as I left, but couldn’t get them fixed and protected for the journey in time. I decided to take it easy instead. I did get a lead on my family tree – my aunt has done a lot of research already, with the things I had been making assumptions about previously. I think she’s gone even further back than I could, and told me that the family had originally come from France (to settle on the Isle of Wight). She’ll dig out what she can find, and I can see how it fits what I’ve discovered. Although it’s not a resolution, I’m still going to be following the family tree this year. I’ll just pick it up as and when I can. Speaking of family trees, one of the benefits of going away was meeting the two new additions – my cousins have had babies! There are a few more expected this year, which is always fun. We’re expecting to be the last, in June. I think that the new babies are my first cousins once removed, and Freddy’s second cousins. Here’s a diagram, showing the new babies in relation to Freddy. It is restricted down to just my mum’s family, and only as far back as her parents (my grandfather, Freddy’s great-grandfather, is also the new babies great grandfather). These diagrams don’t make things in exactly the easiest format to read, but that’s something I can play around with later.